On Friday November 18th there was a first annual Men’s Doubles Tennis Round Robin “Pro-Am” Tournament at the Granite Club, organized by Kosty Gilis and Peter Giacomelli. This fun filled evening began with a buffet dinner and then it was court time. The two captains Daniel Nestor and Casey Curtis spend the evening socializing and encouraging their teams to victory. The following firms sponsored the evening: Birch Hill Equity Partners, Blake, Cassels & Graydon, Deliotte, Ernst and Young, KPMG, Miller Thomson, Onex, RBC, Scotia, Stikeman Elliott and Torys. 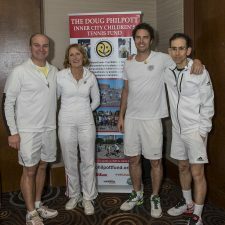 Between the sponsorships and individual donations, forty enthusiastic tennis players raised over $20,000 for the Philpott charity. A huge thank you to the organizers, team captains and participants.